It used to be standard teaching that an 'empty uterus with a positive pregnancy test is an ectopic pregnancy until proved otherwise'. 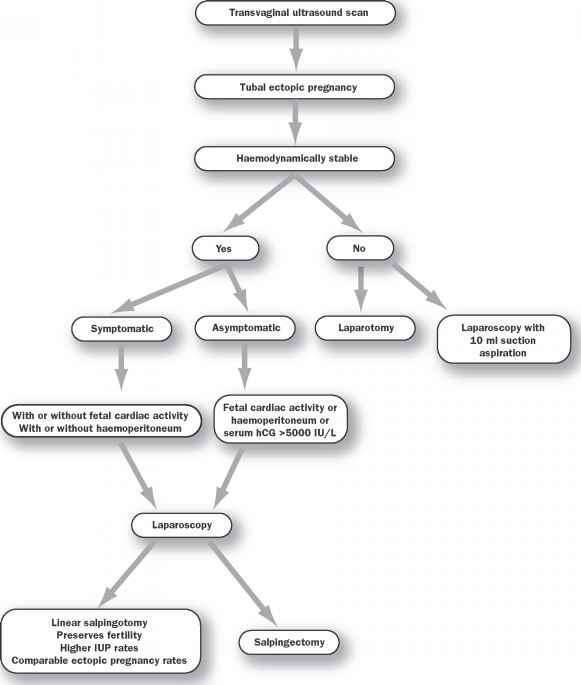 This was based on transabdominal ultrasound findings and usually led to the patient being admitted for laparoscopy. We have seen in Chapter 2 that an intrauterine pregnancy can be visualized at a very early stage. However today if a pregnancy cannot be seen on transvaginal ultrasonography the situation is described as a pregnancy of unknown location (PUL) and the management is described in detail in Chapter 7. 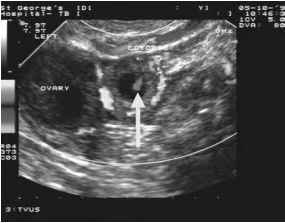 The diagnosis of a tubal ectopic pregnancy should instead be based upon the positive visualization of an adnexal mass using transvaginal ultrasonography (TVS). This does not require particularly sophisticated equipment and conventional two-dimensional grey-scale imaging alone is sufficient to make the diagnosis. Neither three-dimensional ultrasound nor colour Doppler is required. Although TVS has its obvious benefits, surgery should not be delayed in women who are haemodynamically unstable in order to confirm the diagnosis using ultrasound. Common sense must be applied and some patients will need to go straight to the operating theatre on the basis of the clinical findings alone. All women with a positive pregnancy test and lower abdominal pain with or without vaginal bleeding should undergo an ultrasound scan in order to locate the pregnancy. In most cases, if an ectopic pregnancy is present it will be visible on ultrasound. In a recent study in our unit, 90.9% of ectopic pregnancies were correctly identified prior to surgery using TVS alone.1 This high sensitivity has been previously demonstrated with between 87% and 93% of ectopic pregnancies being identified using TVS prior to surgery.2,3 With proper training in ultrasonography and quality control these high standards are achievable. In the absence of an intrauterine sac, the adnexae must be carefully examined in order to exclude or diagnose an ectopic pregnancy. The diagnosis of an ectopic pregnancy is made if one of the following grey-scale appearances are present: (1) an inhomogeneous mass or blob sign adjacent to and moving separately to the ovary1 (Figure 8.1); or (2) a mass with a hyper-echoic ring around the gestational sac or bagel sign1 (Figure 8.2); or (3) a gestational sac with a fetal pole with cardiac activity, i.e. a viable extrauterine pregnancy1 (Figure 8.3); or (4) a y] 15-04--'! Figure 8.4 Twin non-viable tubal ectopic pregnancy. Solid arrows point to both fetal poles. gestational sac with a fetal pole without cardiac activity, i.e. a non-viable extrauterine pregnancy1 (Figure 8.4). A recent study confirmed previously published data relating to the characteristic appearances of ectopic pregnancy on TVS. The majority of confirmed ectopic pregnancies were seen as an inhomogeneous mass or 'blob' (57.9%). A total of 20.4% were visualized as a hyperechoic ring and only 13.2% were visualized as a gestational sac with a fetal pole and 55% of these had positive fetal cardiac activity.1 Misdiagnosis using TVS should be relatively uncommon and in this study the false positive rate was only 5.9%. Using meta-analysis, Brown and Doubilet evaluated the performance of TVS for the diagnosis of ectopic pregnancy.4 Ten studies involving 2216 women, 565 with ectopic pregnancy, were included in the analysis. Four different ultrasonographic criteria were assessed as follows: criterion A, a gestational sac with a fetal pole with cardiac activity, i.e. a viable extrauterine pregnancy; criterion B, a gestational sac with a fetal pole without cardiac activity, i.e. a non-viable extrauterine pregnancy; criterion C, a mass with a hyperechoic ring around the gestational sac, i.e. an empty 'tubal ring'; and criterion D, an inhomogeneous adnexal mass or blob sign. The positive predictive values (PPV) for criteria A, B and C were 97.8 to 100%. In the study by Condous et al., the PPV for criteria A, B and C were 100%, in keeping with these data, whilst the PPV for criterion D was 88.6% compared with 96.3% in Brown and Doubilet's study.1 This high predictive value of TVS for the diagnosis of ectopic pregnancy has made a significant difference to patient management. As will be described in later chapters, the positive finding of an ectopic pregnancy using ultrasound does not require laparoscopic confirmation and expectant or medical management can be initiated without further intervention. 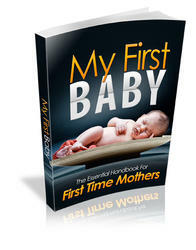 Are You Prepared For Your First Baby? Endlessly Searching For Advice and Tips On What To Expect? Then You've Landed At The Right Place With All The Answers! Are you expecting? Is the time getting closer to giving birth to your first baby? So many mothers to be are completely unprepared for motherhood and the arrival of a little one, but stress not, we have all the answers you need! What is the bagel sign in an ectopic pregnancy on pelvic ultrasound? What sbagel sign in ectopic pregnancy?